HSBC Chairman Green: Crisis has put banks under "unprecedented stress"
LONDON, England (CNN) -- HSBC on Monday announced a 62 percent slide in annual pre-tax profits to $9.3 billion, delivering a further blow for the beleaguered UK banking industry. Green: "It is clear that the banking industry got it wrong." The bank also confirmed it would seek to raise $17.7 billion through a shares issue to bolster its capital strength -- a record sum for a British company. Highlighting $15.5 billion losses in its U.S. businesses, HSBC said it would scale back its operations in the U.S., shutting down its Beneficial and HFC brands with the loss of 6,100 jobs. Unlike other British banks, HSBC has not received any financial assistance from the UK government. But the bank said higher regulatory requirements and changing market sentiment had raised expectations regarding capital levels. The shares issue will see 5.1 billion shares offered at 254 pence each -- a 48 percent discount on Friday's closing price. 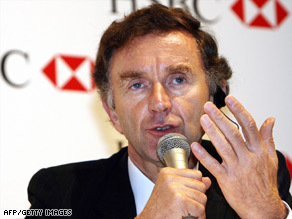 "We want to put ourselves beyond any doubt in regard to our capital strength," HSBC CEO Michael Geoghegan told CNN. "I'm very bullish that it's all going to be taken up... I think our shareholders know it's the right thing to do. They know this company, they know its track record they know its dividend policy. They are supportive." "We continue to believe that we are best on our own," he said. "Our capital rasing rights issue today shows we are one of the strongest capitalized banks in the world. We have no need to have government money and we will continue in that position." In trading Monday, HSBC shares slumped 20 percent on London's FTSE. In a statement accompanying the results, HSBC Group Chairman Stephen Green said the crisis in the global economy had put the financial system under "unprecedented stress" and admitted that the banking industry had done many things wrong. "It is important to remember that many ordinary bankers have always sought to provide good service to their customers; but we must also recognize that there have been too many who have profoundly damaged the industry's reputation," Green said. Green also reiterated that no HSBC executive directors would receive bonuses in either cash or performance share awards and said the bank "intended to play our part in rebuilding public trust in our industry." "It is clear that the banking industry got it wrong in the go-go years," he said. "We will play our part in helping the industry respond appropriately to the new realities."